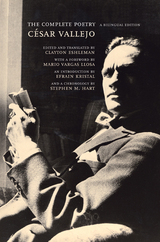 This first translation of the complete poetry of Peruvian César Vallejo (1892-1938) makes available to English speakers one of the greatest achievements of twentieth-century world poetry. Handsomely presented in facing-page Spanish and English, this volume, translated by National Book Award winner Clayton Eshleman, includes the groundbreaking collections The Black Heralds (1918), Trilce (1922), Human Poems (1939), and Spain, Take This Cup from Me (1939). Vallejo's poetry takes the Spanish language to an unprecedented level of emotional rawness and stretches its grammatical possibilities. Striking against theology with the very rhetoric of the Christian faith, Vallejo's is a tragic vision—perhaps the only one in the canon of Spanish-language literature—in which salvation and sin are one and the same. This edition includes notes on the translation and a fascinating translation memoir that traces Eshleman's long relationship with Vallejo's poetry. An introduction and chronology provide further insights into Vallejo's life and work. Poet and essayist Clayton Eshleman is a recipient of the National Book Award and the Landon Translation Prize. He is the cotranslator of César Vallejo: The Complete Posthumous Poetry and Aimé Césaire: The Collected Poetry, both from UC Press. Among Mario Vargas Llosa's prestigious literary awards are the National Critics' Prize, the Peruvian National Prize, and the Miguel de Cervantes Prize. He is the author of more than twenty books. Efrain Kristal is Professor of Comparative Literature at the University of California, Los Angeles. Stephen M. Hart is Professor of Spanish and Latin American Studies at University College, London.